Who's Coming to The American Business Awards Next Friday? The first of two awards banquets for The 2014 (12th Annual) American Business Awards, the premier business awards programs in the U.S.A., will be staged next Friday, June 13 at the Fairmont Hotel in Chicago. 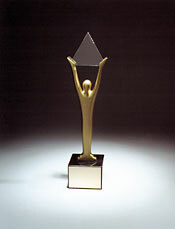 The customer service, human resources, live events, publications, public relations & corporate communications, support and video awards categories, and selected categories for company/organization, management, and marketing, will be presented in Chicago next Friday. The app, IT, new product and service, and website awards categories, and other selected categories for company/organization, management, and marketing, will be presented at a second event on September 12 in San Francisco. So who's coming to the gala in Chicago next week? Here's a current list of the organizations who've already confirmed their attendance. Grass Roots Meetings & Events, Inc.
Oxford City Football Club, Inc.
Want to network with this impressive group of organizations? Get your tickets here.